It’s that time of year…time to find the perfect gift for friends, loved ones and professional colleagues. For unique, one-of-a-kind gifts, look no further than the Armadillo Christmas Bazaar. Celebrating its 41st anniversary, the art and music fair has become a holiday tradition for many. 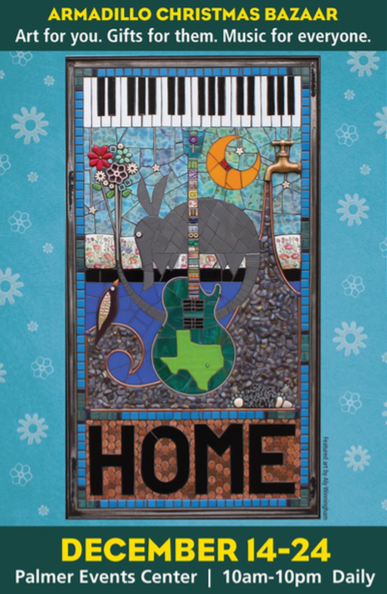 It’s nationally acclaimed festival features regional and national artists alongside live local music performances opens Dec 14th and runs through Dec. 24th. It remains a truly Texan shopping experience which has made the Armadillo Christmas Bazaar one of the Austin’s most beloved holiday traditions. In fact, the Armadillo Christmas Bazaar is an 11-day shopping destination featuring national and local award-winning artists, with live music and two full bars in a festive, lively atmosphere. This annual tradition and cultural icon is one of Austin’s longest running art and music festivals attracting around 40,000 shoppers each year. It all adds up to a fun authentic Austin experience at the Palmer Events Center. Find an exciting variety of art, handmade gifts, heirloom pieces and stocking stuffers for everyone on your list from over 160 curated artists. The Armadillo makes holiday shopping fun in an upbeat, family friendly environment. This is the place to find gifts from the heart, build an art collection year by year, personally meet the artists and commission custom pieces. Want live music? Enjoy at least three bands per day on the Armadillo stage with set times for any lifestyle at 11am, 3pm and 7pm. Featured musicians include emerging stars, local legends and Grammy winners. Armadillo's intimate stage allows you to experience Texas music all-stars in a rare holiday setting surrounded by friends and family. You’ll find shoppers dancing merrily in the aisles with gifts in one hand and a cold beer in the other.